It’s not unusual for our friends in France to ring us just the day before to invite us round for a meal. This charming spontaneity always rather amuses me. Indeed, if it had happened while I was still in the UK, I would have assumed I wasn’t first pick and that someone else had dropped out at the last moment. No so here. Given my beloved’s relentless circumnavigation of the globe or, in recent weeks, long trips back to the UK, I can’t operate with quite the same insouciance even though I pride myself on being able to produce a meal for at least four at the drop of hat. That said, I’ll quite often invite friends round for lunch or dinner during the week while he’s away but will serve what I would typically eat during the week, albeit with a dessert. I often won’t bother with a starter, just some nibbles to chow on in the kitchen while we’re chatting and I’m putting the finishing touches to the meal. Here, last minute invites, particularly those during the summer months, when there’s a crowd, often involves everyone pitching in and preparing a course. Guidance is, of course, required to achieve some sort of cohesion. But, even so, pot luck seems to work out just fine and a good time is always had by all. There are times however when I like to make it more of a special occasion, particularly in the run up to the Festive season. Additionally, we have more space available indoors for entertaining than we have outside. However, our friends’ gardens will trump a balcony every time when the weather’s fine. Having friends round also gives me an excuse to try out a couple of new recipes. Accepted wisdom says you shouldn’t experiment but there are plenty of dishes more appropriate for a crowd than just the two of us. The other great thing here is that people generally eat everything. At first, I used to enquire if there was anything my guests didn’t eat but after being assured countless times that they eat everything, I’ve stopped asking. Their children are the same and will happily eat anything I put before them. A lot of the meals I prepare are ones that cook happily in the oven while I’m out riding my bike or can be quickly assembled or reheated on my return, thanks to plenty of forward planning and preparation. But a festive luncheon or dinner party is different. I revel at the prospect of several days’ preparation in the kitchen beforehand, not forgetting poring through my countless cookery books to choose what I’m going to cook. We’re talking three courses pre-dinner nibbles, petit fours and maybe even goodie bags of edibles to take home – the full nine yards! It usually takes a while for a cookery book to become a well-thumbed, ingredient spattered favourite – I know I should get one of those acetate holders. Some, however, become cherished overnight. My most recent acquisition is Adam Handling’s “Smile or get out of the Kitchen“. For those of you who don’t know, he came to prominence on MasterChef: the Professionals in 2013 as one of the three finalists and many people’s, me included, favourite to land the title. He didn’t win but it quite rightly hasn’t stopped his ascendancy. The recipes are all illustrated so you can see what the final dish is supposed to look like. I’m not sure I’ll be able to achieve his level of precision but I do want to try and match the flavours I’ve no doubt he achieves. I’ve read the book from cover to cover, several times, always a good sign. I first made his pistachio cake for a friend’s birthday party. The recipe reminded me of one of my more popular bakes, Tarta de Santiago, and proved even more delicious. Unfortunately, I forgot to take a photograph of the finished cake. 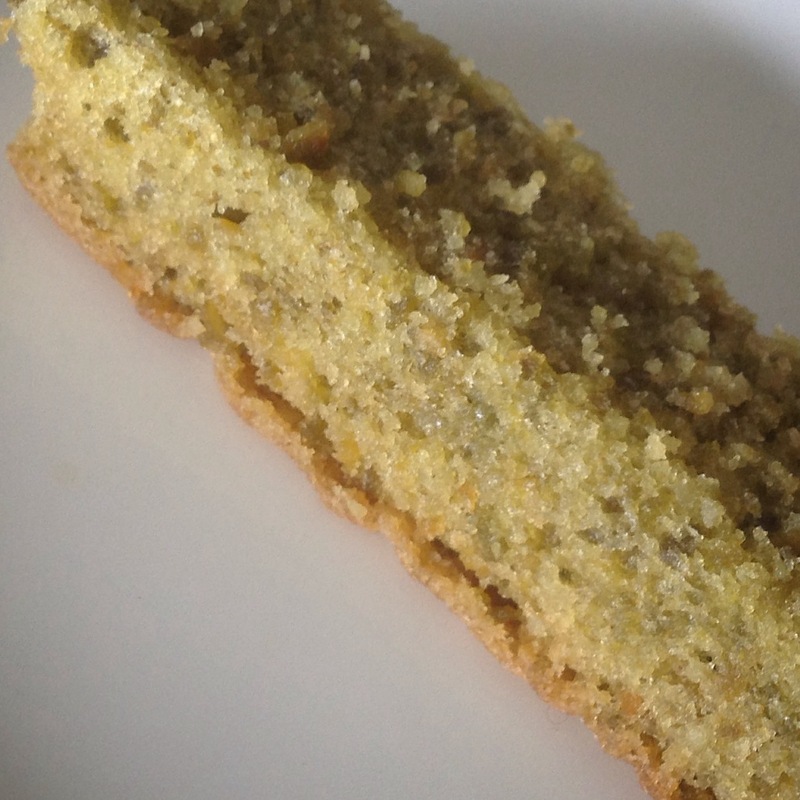 Luckily, I kept back a couple of the edges which I had cut off to neaten the cake and, if I say so myself, it was scrummy. 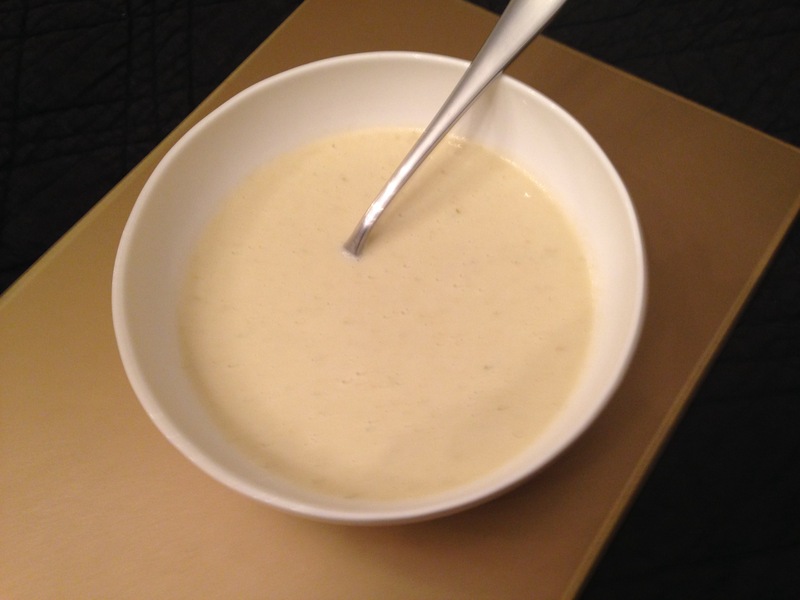 Next up was Adam’s recipe for celeriac veloute, or soup to you and me. I love nothing better than making a big pot of soup to keep me going for a couple of days during the week. This was so delicious that I was sorely tempted to slurp it all down in one go. Fortunately, it’s too rich to do that so my beloved also got to sample it. He immediately said it was the best soup he’s ever had – praise indeed – and I remembered to take a photo! Now, you might be wondering why I’ve only tried two of his recipes. Well, when I test new recipes, I like to take my time, something that’s recently been in very short supply. But Adam’s recipes are going to be providing the inspiration for all my December Sunday lunches. You can buy his book at www.adamhandling.com where you’ll find links to his restaurant – well worth a visit – and his chocolate. I can personally recommend the chocolate which I foolishly shared with my beloved. Won’t be doing that again!